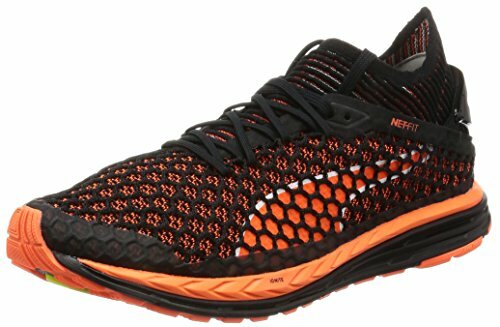 Puma Men’s Speed Ignite Netfit Multisport Outdoor Shoes, Black (Black-shocking Orange-white), 7 UK. Puma Speed IGNITE Netfit Running Shoes More speed, more comfort. Puma’s fastest running shoe to date is infused with pinnacle performance features while maintaining a super light weight. The new NETFIT cage allows you to customise your fit by lacing whichever way best suits your foot type for a more secure and comfortable fit. The dual-layer midsole infused with IGNITE provides longer lasting cushioning and responsiveness. The engineered forefoot Propulsion Zone in the outsole propels you forwards, providing a powerful, snappy toe-off that increases stride length and speed. NETFIT Upper The NETFIT upper works to optimise your fit with completely customisable lace positioning whilst offering lightweight support so you can cruise through the gears and clock up some serious speed without being restricted by unnecessary bulk weight. A smooth, light and sock-like feel forms to the shape of your foot using evoKNIT. Ensure your feet remain breathable thanks to the moulded EcoOrtholite sockliner which wicks away the build up of sweat and moisture so your feet stay cool, dry and comfortable, allowing you to focus on your performance. The sockliner also guards against irritation such as chafing. An additional set of longer laces come with the shoes for further customisation possibilities. Dual Layer Midsole The midsole of the shoe features full-length IGNITE for long lasting energy return as well as lightweight, enhanced cushioning to provide your feet with superior comfort and responsiveness in each and every step. Performance Outsole The engineered forefoot Propulsion Zone in the outsole propels you forwards, providing a powerful, snappy toe-off that increases stride length and speed. This gives you the edge over your competitors as you can accelerate with explosive power as well as extensive comfort in the process. Rubber is stretched over the forefoot flex grooves to provide a snappier toe-off phase. NETFIT Upper – Offers lightweight support and is customisable to suit your needs. evoKNIT – Forms to the shape of your foot to create a sock-like feel. Moulded EcoOrtholite Sockliner – Wicks away sweat and moisture to leave you cool, dry and comfortable as you run. Additional Laces – Further improves customisation possibilities. Forefoot Flex Grooves – Provides a snappier toe-off phase.